The amazing craftsmen of early Christian Ireland created the beautiful Clonfert Cathedral located at Clonfert, County Galway. 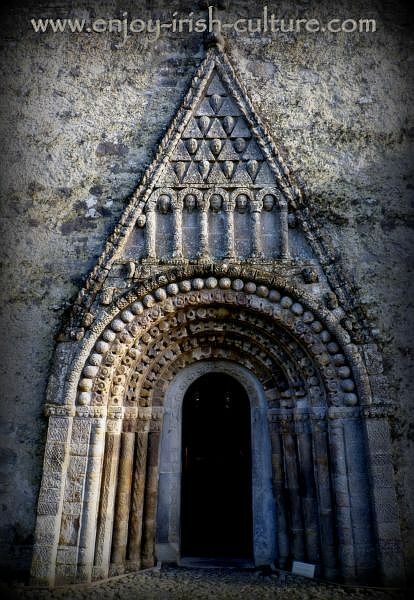 Clonfert Cathedral is best known for its stunning Romanesque doorway that was dated by Professor Thadgh O’Keeffe to approximately 1180. 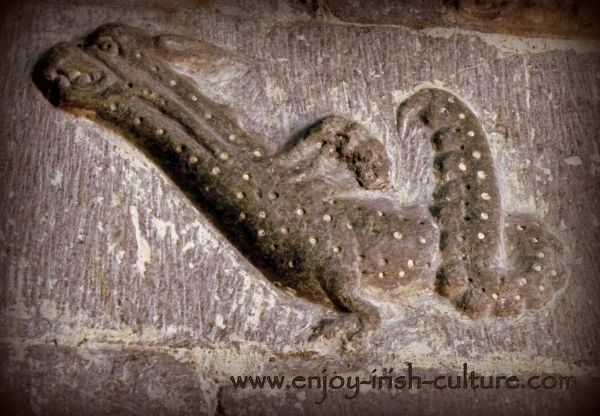 Carving at the doorway of Clonfert Cathedral. Added onto an existing church, the doorway may have been built for a synod that was held here in 1179. The doorway represents the high point of Romanesque art in Ireland. There is a remarkable diversity of motifs, some of which have been traced to Scandinavia and France. There are human and animal heads, interlacing motifs, and there is a small mermaid overhead. More pieces were added over the centuries, for example the two prominent figures either side of the doorway, one of whom may be a depiction of Saint Brendan. Originally these sand stone carvings were painted. There are more stone carvings inside the Cathedral. There are angels and heraldic symbols, even a wyfren. 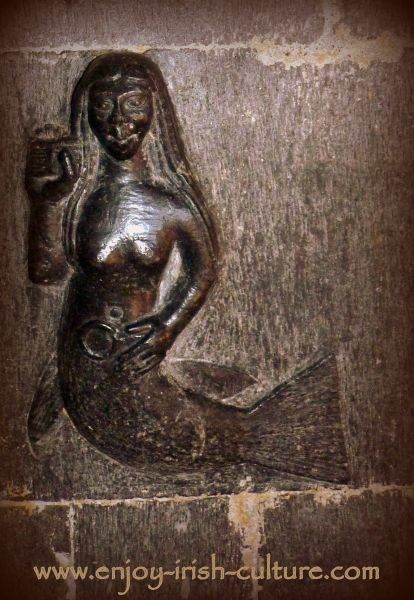 Look out for the wondrous carving of a mermaid on the chancel arch, a beautiful piece of medieval art to marvel at, see her further down the page. The present building was in use from the tenth century on when there would have been a thriving Christian community living on the site already. It now belongs to the Church of Ireland and is used only infrequently. The site appears to have had significance from the times of very early Christian Ireland and perhaps even going back to the ancient Celts as Christian sites were often developed in existing places of worship. The site is located on high ground protected by flood lands on two sides and framed by the river Shannon on three sides. These characteristics are similar to those of other early Christian monastic settlements. Early Christian Ireland produced some remarkable pieces of stone carving which include this beautiful Romanesque doorway at Clonfert Cathedral. Due to the lack of viable agricultural land, the monastery would have never been wealthy. However, the site was wealthy enough to be pillaged, plundered and destroyed a number of times during its active years, but each time it was rebuilt quickly. Clonfert was likely financed by wealthy patrons. There are many heraldic devices present in the carvings inside the church building, meant to pay tribute to the sponsors. There is a lack of clarity though over who the exact patrons might have been. Clonfert Cathedral is difficult enough to find if you don’t have sat nav! But here is an attempt to give good directions. If you want to make this a stopover on your Dublin- Galway trip, leave the M6 at junction 16, heading for Loughrea on the N65. You can by-pass Loughrea heading for Portumna staying on the N65. While travelling along this road, look out for a well-visible brown signpost for Clonfert Cathdral to the left, and for the village of Eyrecourt, and follow those signs leaving the N65 for the R356. Go through Eyrecourt and continue on the R356 for another couple of miles, but at the first proper crossroads that you will hit, you will take a left turn. Don’t expect any more signage after this point. Continue on this road which is very straight. Go through the next crossroads continuing straight on. Shortly after that you will see the building of Clonfert Cathedral on your right. There is no charge for visiting the cathedral. The building is usually locked but you can get a key from a caretaker who lives in a house to the right of the church, just knock on the door. Tradition has it that Saint Brendan founded a monastery here at Clonfert around 560 AD. This was very early Christian Ireland, the new faith was far from secure, there was much hostility all around, but much headway was made by the brave actions of missionaries like Saint Brendan. Sometime after founding this monastery, Brendan embarked on a voyage which was recorded in a ninth century manuscript, long after Saint Brendan’s death. The record was full of wonders such as fire spitting mountains and crystals floating on the water. The Brendan Voyage was commonly viewed as a piece of mythology until adventurer Tim Severin came along and put it to the test to see could it have been a real journey. He reconstructed a curragh in the traditional style, with an ash frame covered in animal skins and fitted with canvas sails in which he sailed all the way across the Atlantic in 1976 with a crew of four. He identified that Saint Brendan might have quite plausibly reached Newfoundland via the north route in a vessel like this which he had built following the descriptions in the manuscript. Early Christian Ireland might have produced the actual discoverer of North America- a thousand years before Columbus. The curragh boat Tim Severin built using traditional materials and methods is exhibited at the heritage museum at Craggaunowen. Wyfrens, which are two-legged dragons, were a mythical medieval symbol. The story goes that when Saint Brendan the Navigator died in 577 AD, dudring the days of very early Christian Ireland, he was on a visit to his sister Breega at Annaghdown where he had had a nunnery built for her specifically. As he wanted to be buried at Clonfert, his body had to be transported back there, and this had to happen in secret for fear of relic hunters. Local tradition will pinpoint Saint Brendan's grave in the Cathedral’s graveyard fixing it to an ancient but illegible gravestone. Our archaeologist friends from Claiomh (check out their historical re-enactment work here) who were with us on the day, pointed out that quite likely, if Saint Brendan was indeed buried here, his grave will be many layers below the ground with other burials on top. If you want to see a really stunning medieval church with magical stone carvings, there is no better place than Clonfert Cathedral. It is quite out of the way though, so it's best to plan your visit ahead of time to get the best out of it. Break your Dublin-Galway journey here some day. Plan about two hours for this add-on. Keep in mind, there are very few services close by. There is a pub in Eyrecourt, but no eateries within a few miles. You might want to bring a picnic, or plan in time for food beforehand. Mobile phone and internet reception, too, is patchy in these parts, so come prepared. 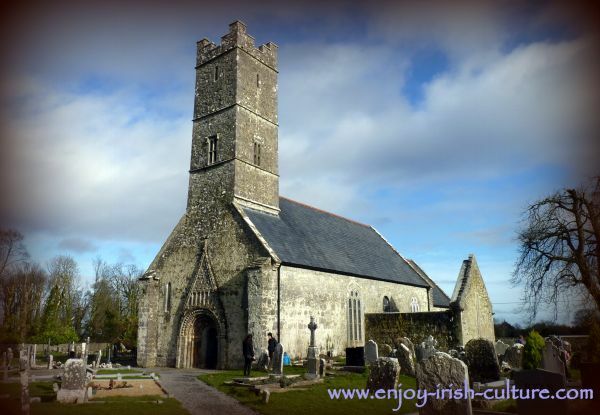 Combine your visit to Clonfert Cathedral with a visit to Portumna Castle, a Tudor manor house a 20 minute drive from there, or to Pallas Castle, a beautiful medieval castle in the care of the OPW. Together, combined with a walk in Portumna woods perhaps, you are looking at an all day excursion then. If you'd like to stay in the area, consider the Slieve Aughty Centre which offers eco accomodation, a riding centre, and various events throughout the season. 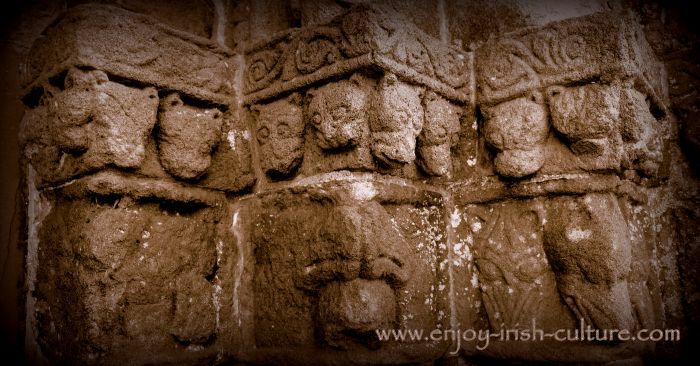 Hello there, hope you enjoyed this page on early Christian Ireland at Clonfert Cathedral. If you did, why not tell your friends about our website so they may enjoy it, too? It's quick and it's easy if you use the social functions we provide on this website, at the top left of the page, and at the very bottom. Thanks a million for your support.